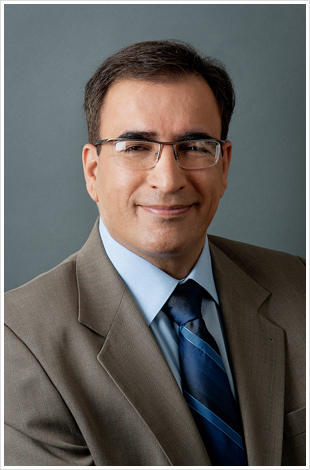 In private practice since 1998, Dr. Majid Rajabi Khamesi pursued his dentistry education at Columbia University School of Dental and Oral Surgery, where he obtained his Doctorate in Dental Surgery (DDS) in 1995. After graduating, he completed a two-year residency in Advanced Education in General Dentistry, also at Columbia. Prior to his dentistry training, Dr. Khamesi earned a Bachelor of Science degree in Chemistry from Howard University. A member of Phi Beta Kappa, he attended Howard on a full tuition trustee scholarship and graduated with multiple honors in 1991. Throughout his career, Dr. Khamesi has been committed to advanced continuing education and strives to be at the forefront of his profession. He has acquired specialized training in various disciplines within the field of dentistry from several esteemed institutions, including Oral Plastic Surgery from the Center for Advanced Dental Education, where he studied under Edward P. Allen, DDS, Ph.D., the center’s founder, director, and a globally respected pioneer in esthetic periodontal surgery techniques. Dr. Khamesi also earned certification from the highly regarded Progressive Orthodontics Seminars, the world’s leading orthodontic training resource, after completing its two year academic and clinical program. From 2008 to 2010, Dr. Khamesi pursued his passion for advanced implant care at the prestigious Misch International Implant Institute, world renowned for imparting an unrivaled education in progressive implant rehabilitation. While at Misch, he trained under several of the most prominent implant authorities and specialists in the world. Upon the completion of his coursework, he passed the program’s arduous exam, a significant achievement shared by only a slim percentage of his peers worldwide, and attained the honor of the Institute’s Fellowship. This distinction placed Dr. Khamesi among a small, elite group of exceptionally skilled dental care providers. 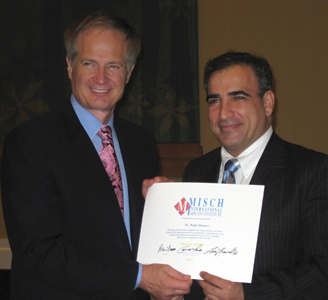 Further underlining his exceptional scholastic and clinical performance, Dr. Khamesi was one of only a select few practitioners chosen for the privilege of receiving direct, one-on-one training and instruction from Dr. Carl Misch himself, the Institute’s founder and CEO, and an international trailblazer in the field of implant surgery and oral prosthetic care. Granted special permission from Botsford Hospital in Farming Hills, Michigan, Dr. Khamesi teamed with Dr. Misch to perform a complicated hip graft procedure that resulted in an innovative, transformative oral rehabilitation in a newly reconstructed maxilla. Over the course of four years, Dr. Khamesi acquired additional, multidisciplinary training at the acclaimed New York University College of Dentistry, completing its Full Mouth Reconstruction Program. The program expanded his knowledge in the diagnosis, treatment and management of both conventional and non-conventional implant rehabilitation cases, and heightened his expertise in fixed, removable and implant prosthodontics. While at NYU, he also completed The New York Maxicourse in Oral Implantology, earning an additional certification upon fulfilling its intense, 300-hour advanced training program. Dr. Khamesi’s practice reflects his dedication to leading-edge dental therapy. As a premier practitioner, he takes great pride in his use of only the most sophisticated technological advances in both equipment and materials including power magnification, digital radiology, digital photography, computer simulations of proposed treatments and the PRGF (Plasma Rich Growth Factors) technique, the most recent advancement in bone and tissue regeneration. He is also a proponent of oral sedation, which has been particularly successful with patients who suffer from apprehension, and is licensed to administer IV, or intravenous, sedation designed for special cases of severe anxiety.